They call Lizanne ‘Miss Blood’ now. Suspended from the Ironship Exceptional Initiative Division for the time being, she may be, but hero and saviour she remains to many. A formal hearing will decide her fate. Her peers will debate the truth of her report on the events at Carvenport, but the truth is known. Regardless of the outcome, much of the future still rests on Lizanne’s young shoulders and broad abilities. Demoted to third mate Hilemore may be, but the ship has a blood blessed and he is not ready to give up yet. Besides, Clay is with him now, and Clay has seen the White Drake and lived to describe the encounter. Product is in short supply but that will not stop them either. Mutiny may be the only option, it seems, but Hilemore knows that comes with dire consequences. Still, what must happen will happen. Sirius and the Spoiled are with the White Drake. He has drunk its blood and it has changed him beyond measure. The White can see his value, and he has little choice but to obey. 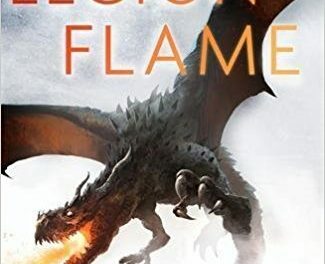 The Legion of Flame is the second book in Ryan’s The Draconis Memoria series and delivers another dragon-heavy, action-heavy adventure on an epic scale. For a book to get lost in for a good several hours during summer days this is perfect. There are shocks and twists aplenty, a brilliant cast of supporting/opposing characters and a magic system and setting that is solidly conceived and expertly controlled. 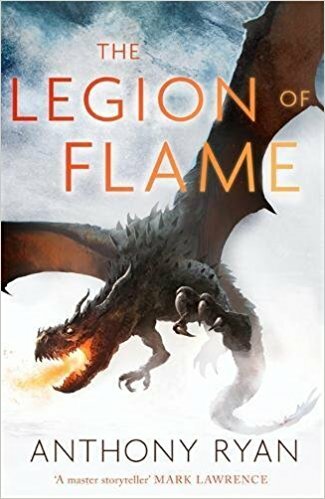 This is a good follow up to The Waking Fire and maintains many of its strengths. Lizanne remains the stand out character of the series and her narrative is arguably the primary focus in this book despite other point of view characters taking their fair turns. Something about her grit and determination fires up the reader. We root for her. We laugh with her. As she plunges into the next danger we plunge with her. Clay is a close second as he faces the many struggles of his past and present, with new point of view character Sirius providing insight into the dreaded White Drake.